Garden Grove Steering & Suspension - Morrison Tire Inc.
Often times, problems are not immediately noticeable to a vehicle owner. This occurs because some of these components can wear slowly over time, allowing the driver to be accustomed to irregular patterns. At Morrison Tire, we recommend the steering and suspension system of your vehicle be inspected every 10,000 miles or if you have a noticeable problem. 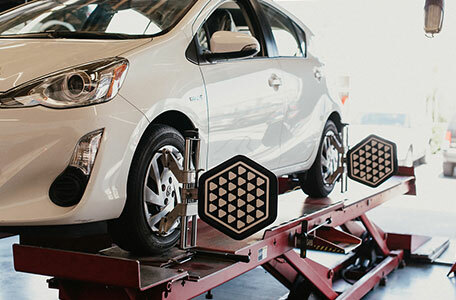 Our technicians can provide a proper road test, vehicle alignment when necessary, and inspection for any components not acting as original equipment. Shocks and Struts are the main component of your suspension system. Normal vehicle usage over an extended period of time will cause shocks and struts to lose their efficiency and ability properly handle and operate the vehicle. This can cause wear on other vehicle components and decrease ride quality. Replacing your shocks and struts will help restore the vehicle to original equipment ride quality or better. It can also help prolong brake wear, tire wear, strengthen stability control, handling, and drastically increase ride comfort. We offer a lifetime warranty on KYB and Monroe shocks and struts and 24,000 mile warranty on the labor. Contact your service advisor today for more details.